He's not really hungry an hour after lunch but it's a quiet moment. Often, during quiet moments their father will stand in front of the open cupboard searching for inspiration. The inspiration he seeks most usually comes in the form of biscuits and other treats. I notice that diabetics also seek the same inspiration during noisy moments, but maybe it's only solace? “Why don't you make yourself a sandwich if you're hungry?” I mention rhetorically. He ambles reluctantly away from his mental crutch to begin sandwich assembly. I am busy in the kitchen, the very small galley kitchen. It is not possible to be furtive in a very small kitchen with two people, but that doesn't prevent him from trying. Life partners are able to communicate without words. I look at his half made sandwich. The inch thick layer of butter is not beneficial to a person with high cholesterol and dodgy blood pressure. I look at him, so that the message will pass one to another. He sighs because I am a kill joy as he scraps of the surplus and deposits it back into the butter dish, crumbs, debris and all. I raise an eyebrow towards the contamination. His shoulders shrug as he removes the detritus with his knife. The knife, detritus and extra butter lie on the edge of the plate. I turn to hang up the saucepans. His body movements are entirely predictable as I see out of the back of my head. I flip around to see the knife whip out of his mouth. He is able to read my eyebrows; 'you'll cut off your tongue!' His first born son blunders into the kitchen, no doubt lured by the smells. He staggers about with the uncertainty of a drunk heat seeking missile. Synapses fire as he spots the butter dish and glides past with a co-ordinated scoop, duck and dive for cover sequence. Purposeful but wordless. I frown with disapproval, his father grins. Now would seem as good a time as any to make an afternoon snack for all the hungry tummies that are about to enquire when the next nose bag will be available? A pre-emptive strike on my part. I assemble calories in a simple trough formation, chips and dip in the middle of the table and call in the farrow. I scatter Goldfish crackers into a bowl for the youngest, whilst I tutor his older sister in the art of table manners. It is a standard list of the 'elbows off the table' variety but lengthy none the less. With her as their role model, the boys, all of them, attempt to copy. Three pairs of additional elbows of varying sizes, slip off the table. “Like him!” she nods as her little brother. 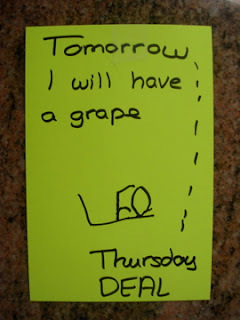 “Yes right!” I may not be all that quick but even I can detect the note of sarcasm of pre-teen attitude. Well really! I turn to the little one stuffing in the last couple of Goldfish. “There you go!” I beam at her. “Look!” she demands. I look. I see a nearly, seven year old, approximately sitting on his hunkers on a chair, fairly near to the table. Not static but not stimming. Clearly my bifocals and campaign trails are in need of a few more minor adjustments. Posted on November 7th, 2007. My definitions and categories become looser with every advancing year, a very sloppy habit. It's probably just a survival mechanism on my part. Gone are the days where you encouraged your off spring to delicately dab at the corner of the mouth with a serviette. [translation = napkin] These days I'm satisfied if we can spend communal minutes in one room that happens to have the dining room table and food in it simultaneously. I sit next to my son at the breakfast table, enfeebled by the 25 minute fruit fight. I'm not sure who has won. Technically, since the fruit is inside him, I should be able to claim victory. He sits cross legged and half naked on his furry red cushion. The chair is at a thirty five degree age to the table, about an eight inch span for his body to stretch. It’s the left hand side of his body. This would be an appropriate stance in an old fashioned bar, with a pint at your side whilst you chatted to a friend opposite you. Or would be if you ignored the lower half of his body and the issue of underage drinking. A wide variety of comments come to mind, running along the lines of 'sit up straight,' elbow[s] off he table,' 'legs down,' and so on, but they stay in my head. His spoon flaps from his floppy hand showering cereal over a 4 foot radius with every welcome mouthful. It is stunning just how difficult they make this simple operation. He is a suspension bridge from chair to table, but that's only to be expected if you have poor muscle tone, as so many autistic children do. 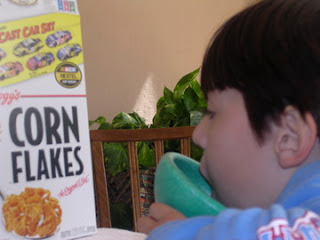 [translation = poor core strength] His head is on one side, which helps keep the cereal inside, since his mouth is open as he attempts mastication. I wonder which is more important, to eat your cereal politely or be able to breathe at the same time? I cannot recall ever having eaten anything in a similar pose, even though I try really hard to remember what it was like to be little. How can you eat if you're not sufficiently interested to even look at your bowl, where the food is located? There again, how do you expect to eat anything if you have to think about holding a spoon and have no concentration? If you can't connect the spoon to the contents to the mouth, a triangle sequence, then starvation is likely. Clearly a species that doesn't eat efficiently is on the downward path. 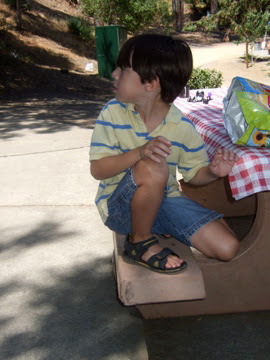 I think Darwin would have a lot to say about my son. He is the picture of disinterest, he is merely refueling on something that isn't offensive. 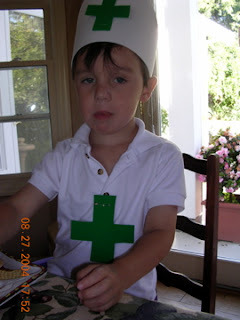 He is just sufficiently and minimally connected to the whole proceeding of breakfast, to eventually complete the operation. He is perfectly positioned for escape when the exercise is over or whenever his calorie count is sufficient, whichever happens first. When the 334th energy unit is registered, he'll drop the spoon and catapault off that chair to start anything that isn't in the category of eating. I watch the floppy spoon flap a bit, debating whether he's on the 300th calorie spoonful or the 335th?